A hodometer is a counter fixed in a coach and connected by a transmission to one of the wheels in order to measure distances covered by the vehicle. 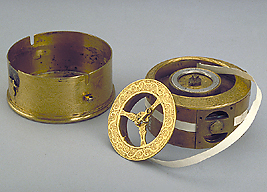 This instrument is very similar to a hodometer in the National Museum, Copenhagen, but is incomplete. Neither of the two instruments is signed or dated, but comparison with hodometers of the same type in the Germanisches Nationalmuseum in Nuremberg signed by Thomas R?ckert suggests that they may have come from the same workshop in about 1580. Both hodometers record automatically on a paper strip and may be the earliest recording instruments known.